This is a blog about SEO stuff, so why am I writing about mechanical keyboards? Because I believe they are far superior to the stock rubber dome keyboard you’re probably using right now. A mechanical keyboard has switches, which use small springs to control compression force and rebound. Remember those old clacky keyboards from the 1980s? Those were mechanical keyboards. Not all modern mechanical keyboards are loud, but they do usually make a bit more noise than their rubber dome counterparts. How do the switches work / what kinds are there? There are a few manufacturers of switches, and the most popular right now is a company called Cherry. Their switches have a very long lifespan of 50,000,000 strokes and come in several different configurations. The gif below shows the inner workings of a Cherry switch. The coil spring underneath offers the resistance as the key is pressed. Pay attention to the two little gray pieces on the left. Those are the pieces of metal that make up the actual switch. You can see that when the key is at the top of its stroke, the two metal pieces on the left are separated by a bit of plastic that is molded into the larger moving part. Notice how the piece of metal on the left wiggles left to right as the key is depressed. That little wiggle offers tactile feedback to the typist (not every Cherry switch has that “tactile bump”). When the key is at the bottom of its stroke, the metal piece on the left meets another metal piece which completes a circuit. When the circut is completed it sends a signal to the computer indicating that the key was depressed. Mechanical keyboards offer consistent resistance and a linear stroke (rubber domes can deflect different which means each key might deflect a different direction). Consistent resistance and a linear stroke means you can transition to the next key quickly and with confidence that your last keystroke registered. The length of the stroke of mechanical keys can be changed by adding special spacers to the posts of your keycaps. Reducing the stroke means you spend less time depressing each key. Consistent resistance and a linear stroke increases typing speed. I personally went from about 80-90 words per minute to 100-110 words per minute when I made the switch to a quality mechanical keyboard. 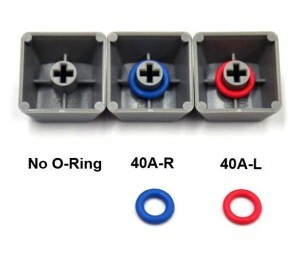 These little o-rings come in different thicknesses and go on the posts of your keycaps. The different thicknesses reduce the stroke of the keys different amounts, reduce typing noise and cushioning the key when it bottoms out. This topic is pretty hotly debated. It really comes down to personal preference. I recommend you get a sample switch set to test the different types of switches that are on the market. WSAD keyboards offers a sampler pack which will allow you to try each type of key Cherry makes. You can try each switch in combination with different spacers to find one you really like. Once you find the switch, check out a few manufacturers to find a layout you like. Don’t forget Cherry makes LED switches so your keyboard can light up and you can get them in a ton of colors. WASAD’s key sampler pack is a must before you choose which keyboard to buy! One of the most fun things about mechanical keyboards is that you can change out your switch caps. The internet is full of different options and you can even 3D print your own! 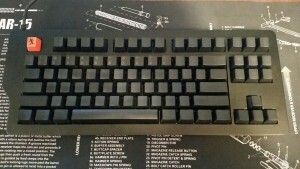 Like rubber dome keyboards, mechanical keyboards come in different sizes and and a few companies make ergonomic boards. Keyboards come in 100%, 90%, 80% 75%, 70% and 60% layouts. 100%, 80% and 60% are readily available. This is a Ducky Shine 5 with RGB LCD backlighting. This is a 100% board. This is an MK Disco TKL with LED Backlighting. This is an example of an 80% board. Note that it’s missing the 10-key. This is a KB Paradise V60 with LED backlighting. This is an example of an 60% board. This keyboard lacks the 10-key, arrow keys, and more. I personally like DAS Keyboard and currently use a DAS 4C Ultimate which is an 80% board. I like the lack of the 10-key because it gives me more room for my mouse next to the board so I don’t have to reach as far to use it (pictured below). I like the blank keycaps but I did get marked caps for my number row because I can never remember where the carat is. Here’s a link to my board, and here’s a link to my desk mat, in case you’re interested. My keyboard, a DAS 4C Ultimate. You mentioned rubber dome keyboards, what are they? 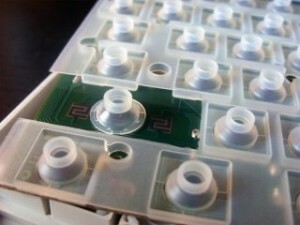 A rubber dome keyboard relies on the deformation of a little rubber dome to register a keystroke. Each key has a corresponding dome underneath it which deforms as you push the key down. That deformation is what provides the resistance when you press a key. Over time the domes wear unevenly which will make the keys you use frequently (e, a, etc.) feel differently from keys you don’t use as often (q, z, etc.). The change in elasticity increases rebound time and reduces positive feedback when you depress a key. As a keyboard ages it typically becomes less accurate. These are rubber domes. They squish when you type and that’s what creates the resistance and rebound on most boards. Also why they are so cheap.